In the 2010 election, higher education acquired a surprising prominence, notoriety even, as a result of the Liberal Democrats’ position on student fees. What a U-turn that was – from a promise to abolish fees entirely to acquiescence in a decision to triple them from £3,000 to £9,000. This time round it looks unlikely there will be the same excitement. In only a small number of seats could the student vote could be decisive. In the last election the Liberal Democrats captured 44% of the (full-time) student vote. According to polling last year, this has plummeted to a miserable 13%. Although Labour has gained most from the slump in the Lib Dem student vote, no more than 12 seats – six Conservative marginals and six Liberal Democrat seats (not including Nick Clegg’s Sheffield Hallam constituency) – are at risk. And student registration and turnout will be the key. It doesn’t add up to an electoral earthquake even in a tight election. The majority of staff and students will, once again, tilt to the left – but probably to the Greens and, in Scotland, to the SNP as much as to Labour – and without much hope that the tide of marketisation will, or can, be reversed. The higher education establishment has nailed its colours to the Tories’ mast in an ill-judged letter to the Times criticising Labour’s plan to reduce fees to £6,000 – or rather the board of Universities UK has, probably without properly consulting its vice-chancellors. 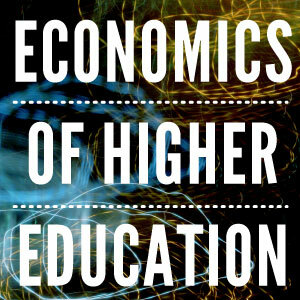 Fees are higher education’s election battleground. The Conservatives, with the Liberal Democrats hovering guiltily in the deep background, claim the existing policy of high fees has been a “success”. True in the very short term. Full-time student numbers have held up and university income has been boosted, which is why the “boss class” supports high fees. But in the medium and long term the premise is false. First, graduates will be burdened with more and more debt. It is only when the reality of debt sinks in that we will know what the real impact on demand has been. Second, future governments will also face an escalating bill because more than 40% of graduates will never pay back their loans. At some stage student debt will exceed consumer debt, and the strain on public finances will become unsupportable. Only the most rash optimist imagines that the present system of student fees and funding is sustainable. Like all disguised taxes – the Private Finance Initiative, energy bill surcharges, sky-high rail fares – student fees funded by cheap state loans are a short-term fix that probably costs taxpayers more in the long run than good old-fashioned public funding. There are really only two options. One is to plunge into root-and-branch privatisation – which means selling off the student loan book (presumably to hungry hedge funds), which can only happen if students/graduates are forced to pay commercial rates on their loans (as they do in the United States). Although it is not in their manifesto, that is the Conservatives’ plan. The other option is to cut fees, as Labour proposes to do, by reducing the current cap of £9,000 to £6,000. This would have two advantages. The future debt burden on graduates would be eased. Paradoxically, the government’s future exposure for funding unpaid loans would also be reduced, which would allow more scope for targeting subsidies on disadvantaged students. Labour’s plan could even eventually pay for itself through higher economic growth (and tax revenues) because hundreds of thousands of graduates would not have their income dragged down by debt payments, and their spending power would be boosted; and less public resources committed to finding the money for up-front loans (and their partial repayment). But, to reassure nervous vice-chancellors worried about their £9,000 fee nest eggs, Labour has explained how the short-term shortfall in income would be funded – by reducing pension tax breaks for the rich. Neat intergenerational redistribution – robbing a few, rich oldies to help a larger number of, maybe one day rich, or maybe not, youngsters. What’s not to like? So an unexciting election offers a perhaps decisive choice. A re-elected coalition, especially with the balance of power within it tilted even more decisively to the Tories, would lead to even higher fees and, inevitably, tougher terms for loan repayment. The result would be irreversible marketisation. A Labour government, especially if it relied on the no-fees SNP, would break the momentum towards ever higher fees – created, lest we forget, by New Labour, which entered office with free higher education and left with £3,000 fees. Even in a more radical post-Blair frame-of-mind, Labour is probably reluctant to follow the logic of reducing fees, which is to restore public funding of higher education. But even a pause on the road to market perdition is worth fighting – and voting – for.